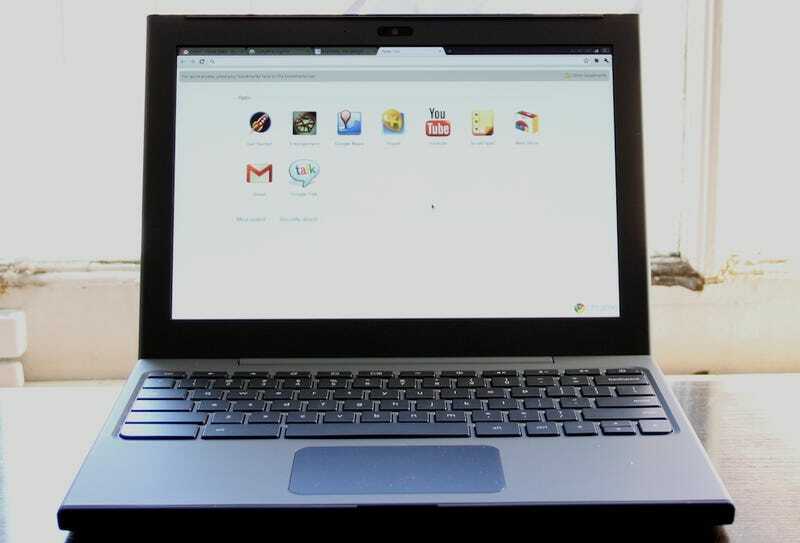 The Chrome Cr-48 netbook might just be a reference design—as in, most folks won't ever be able to use it—but it is what Google thinks a Chrome laptop should be. And it has some pretty nice touches. Updated. Here are some quick impressions on the hardware and software that we gleaned from about an hour's worth of usage. • The trackpad really does not like having two fingers on it at once. It's not multitouch, but you can use two fingers for right clicking. Update: Extended impressions. Google really wants people to use the web, and having a web-only computer pretty much forces you to do so. I've been using the Cr-48 for a few hours now, and I can both say that it's the best netbook I've ever used, as well as the most limiting computer I've ever used. Being locked into a browser for everything you do on a computer can be frustrating. It's modal computing—something that Apple seems to be pushing with their OS X Lion—so you're always working in one maximized window. You can still multitask in the sense that things are going on in tabs and windows that you're not looking at, but you can't really see more than one thing at once. Except, as a notable example, the fact that GChat windows pop up no matter where you are, effectively enabling web-based apps to transcend the window they belong to. Some quirks and pains of using a web browser are more significant when you're using one as an operating system. The search button, Google's "replacement" for the caps lock key, brings up a new tab. Logically, you'd assume the search button allowed you to say, search in Gmail, if you were in a Gmail window, or search your previous chat transcripts if you were in GChat. Also, Flash has crashed a lot. It doesn't take down the tab that it's in when it crashes, but you have to reload every single tab that you have that uses Flash. But overall, working entirely in a web browser isn't too bad, as long as you have web-based versions of things you need to do. I'm not quite there, but I'm convinced that with a few weeks effort, I can be. Again, because Google doesn't intend this particular Cr-48 model to be an actual product, there's no need to review the hardware. However, there are touches, ideas and themes that Google has put in that they would like their hardware partners to carry on. The SD card reader on the side is quite handy, as is the existence of a USB port. The keyboard is also matted and nice to type on, and matches the rest of the finish. And I can't emphasize enough how cool it is to be using an unbranded, unmarked, totally generic laptop. This is like the Nexus One/S of notebooks. I suppose the fact that this is running an Atom processor is holding it back from being a blazing fast experience, even if all you're doing is web-based computing. Alt-tabbing may be fast, but everything else, like Google docs, Gchat, and other things that are supposedly lightweight will run slower than you're used to. I mean, when was the last time that Google Docs lagged on keypresses for you? So, hopefully the third-party manufacturers that do do Chrome OS notebooks find a way to balance extended battery life with the need for slightly more powerful hardware. It's a very good secondary machine, or travel machine, but in order for it to be a primary machine, you're gonna need more juice.